The idea of getting energy from waste has a long history, and at different times and in different parts of the world, a variety of methods have been tried. The allure of being able to simultaneously deal with the kind of materials that are difficult – if not impossible – to recycle and generate a contribution to help meet the local demand for heat and power is obvious. As the pressure continues to grow to minimise the amount of refuse being consigned to landfill, the question of finding suitable alternatives inevitably emerges, and with its twin promises of beneficial disposal and energy generation, ‘thermal recycling’ has an obvious appeal. For all that, however, the topic remains a somewhat controversial one, both for communities facing the prospect of such a plant, and for the local authorities and waste disposal companies advocating its use. So, is thermal recycling the salvation to our problems of difficult waste and expensive energy – or is it no more beneficial than a bonfire? There’s no denying that it’s a very hard question to answer, and as Obi-Wan Kenobi famously (and, of course, fictitiously) observed, in the end much of what you believe comes down to your point of view. One of the main criticisms aimed at the whole idea of thermal recycling is that it is simply incineration by another name – a shameless attempt by its supporters to make it sound a little more acceptable and eco-friendly. It certainly wouldn’t be the first time that something unpopular has been re-branded in this way; today’s ‘landfill’ undoubtedly sounds a lot prettier than ‘the dump’ of years gone by, but giving it a nicer label doesn’t alter what it is or does. 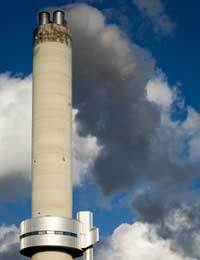 There’s no getting away from the fact that modern thermal recycling plants are incinerators at heart. They burn waste – that much is fundamentally true – but incinerators in the 21st Century are a long way away from the old-fashioned smoke-belchers of earlier times, and these days it really isn’t only about getting rid of rubbish. The latest generations of these plants are equipped with very sophisticated and highly efficient thermal recapture technology, enabling a significant proportion of the calorific value of the combustible waste to be reclaimed and beneficially re-used. Many drive district heating schemes, with the heat being provided at a subsidised rate to nearby business parks and commercial units – and sometimes to local households too. In some cases, the heat is also used to drive on-site generators, to provide electricity. That, the supporters of thermal recycling say, is what makes the difference and why the approach shouldn’t be tainted with the negative image of yesterday’s mass-burn incinerators. But What About the ‘Nasties’? The spectre of pollution has driven much of the public disquiet over these plants, and it’s easy to see why people would be less than enthusiastic about the prospect of black clouds dropping untold chemical contaminants over local homes, schools and hospitals. Unfortunately, the incinerator industry doesn’t have an unblemished record on this – at least not historically – although the pollution control technologies, and particularly the scrubber systems designed to clean the smoke before it is released into the air, that are used in today’s versions have advanced beyond all recognition. In short , it just shouldn’t be able to happen now. Never-the-less, the prospect of furans and dioxins falling from the sky, coupled with the absence of any real expert consensus on just how likely or dangerous such a scenario might be, makes the general unease over the whole idea entirely understandable. Another issue that tends to get both sides of this debate a little hot under the collar is whether or not it really constitutes recycling. If you look at it dispassionately, it’s hard to go along with the anti’s viewpoint that is it just a mass disposal route with a little heat siphoned off to make it look a bit better and get through planning. The heat-recovery technology is far too complex – and costly – to be included for purely cosmetic reasons, and besides, for some of the larger facilities, particularly in parts of Europe, the energy generated forms an important additional revenue stream for the operators. That said, however, it certainly isn’t recycling in the traditional sense; the material has gone forever and it won’t be coming back as a ‘new’ something else, like recycled paper or glass does. All that remains is the heat, and a relatively small volume of ash for disposal – and this potentially contains a concentrated brew of contaminants, depending on exactly what the incinerator has been burning. You can see the case for calling it heat reclamation, but is it recycling? Maybe, and then again, maybe not; we’re back in deserts of Tatooine with Obi-Wan – it depends on your point of view. That’s the thing about controversies; they always do.